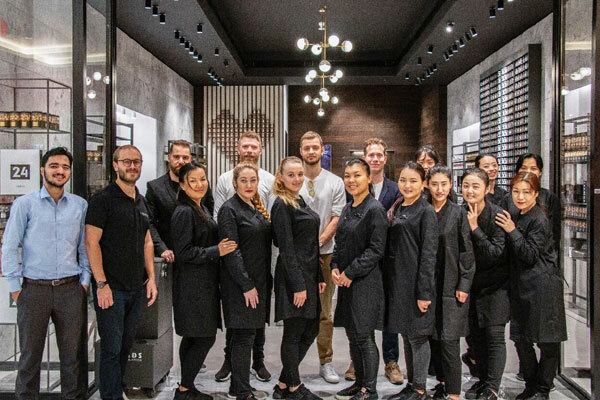 Bringing a unique combination of Belgian chocolate and Danish liquorice, Lakrids by Johan Bülow has unveiled its first flagship boutique at The Dubai Mall, the world’s largest shopping mall in the UAE. With this move, Lakrids aims to introduce the region to the succulent world of liquorice, a luxury hand-crafted liquorice brand that uses only premium raw materials with no additives and is completely gluten-free. While the brand already enjoys several pop-up spaces across Dubai and over 25 shops across Europe, this is the first stand-alone Lakrids boutique outside of Europe, whose interiors have been specifically designed to cater to the international audience. Located in the Fashion Avenue at the lower ground level, the interiors showcase the story of Founder, Johan Bulow and his deep-rooted passion for liquorice. The cosy and inviting walls are built from natural stones found in Palermo, Italy to make the guests feel at home, and combined with the warm and dim lighting lend the space a very welcoming and elegant touch, said a company spokesman. The highlight of this boutique remains the liquorice library (which also happens to be the world’s largest liquorice library) where you can learn more about the story behind the brand and its various flavours, while experiencing a taste of its delectableness, he stated. "This storytelling station will also educate patrons on how the liquorice roots are harvested and the origin of the cocoa bean, as well as the production and maintenance process behind each of the delicious flavours to how they are paired and coated with a complimentary chocolate taste," said the spokesman. With a mission to make the world fall in love with liquorice, this one-of-a-kind boutique has all the mouth-watering flavours one can’t resist some of which include Salty Caramel, Rose, Mint Dark Chocolate, Raspberry Chocolate, Blueberry Chocolate, Dark and Sea Salt, Passion Fruit, and Coffee, he stated. Inspired by his mother and love for liquorice, Johan Bülow created Lakrids on a small Danish island to introduce the world to a gourmet liquorice experience. Over a decade ago, Johan Bülow decided to throw his passion into liquorice – a Scandinavian favourite that he felt was underappreciated and deserved to be taken seriously. After putting several hours into the craft and perfecting it, he opened his first shop with the idea of cooking liquorice in the shop, so that customers could smell it in a radius of 100 meters. His idea not just worked, but also led him to install a liquorice machine to meet with demands. Bulow further developed his best-selling idea by coating the liquorice with layers of Belgian chocolate, which in turn blended with a variety of ingredients from blueberries to sea salt to passion fruit. The resulting balls are known today as Lakrids. All these products are made from natural ingredients, with rice flour and are gluten-free. Lakrids also produces sweet and salty liquorice syrup and liquorice powder. With a vision to spread the love for liquorice around the globe, Bülow fulfilled his dream of proving that an entire new world of pleasure lay hidden in the raw liquorice root through Lakrids, said the spokesman. Today, Lakrids employs 300 people and owns more than 25 shops across Denmark, Norway, Sweden, Germany, Finland and The UAE and numerous shop-in-shops, he added. At the Dubai outlet, there is also a private lounge section for customers to sit back and discover the world of Lakrids and see the different gifting options available for special occasions, as well as a very instagrammable corner with a Heart made out of Lakrids very own jars. Lakrids promises to make its unique and varied flavours of chocolate covered liquorice the latest acquired taste across the region, said the spokesman.